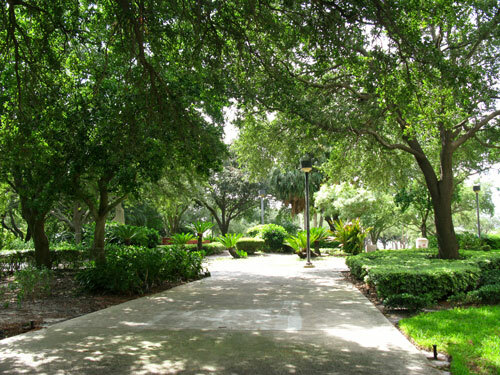 Pioneer Park, in downtown St Pete, is quiet and restful. 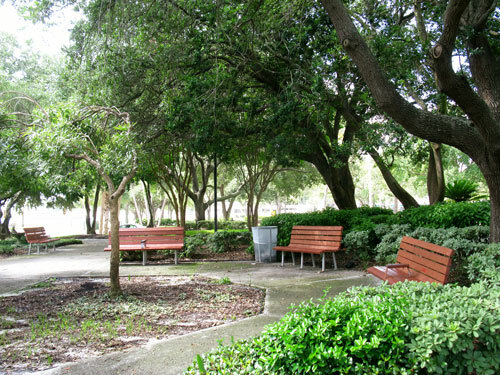 This little one-square block park is part of the St Petersburg Waterfront Parks system. It's a great place to watch boats, read the paper, or doze off. 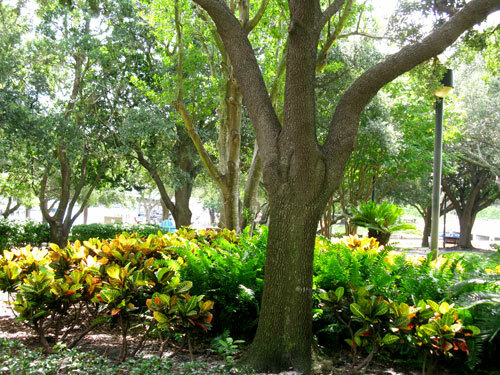 Bounded by Beach Drive on the west side and Bayshore Drive to the east, this beautiful little park is hugged between Central Avenue and 1st Avenue South. 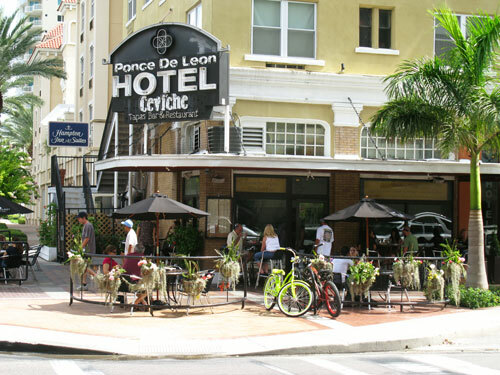 It is a relaxing respite right across from the St Pete Yacht Club Marina. 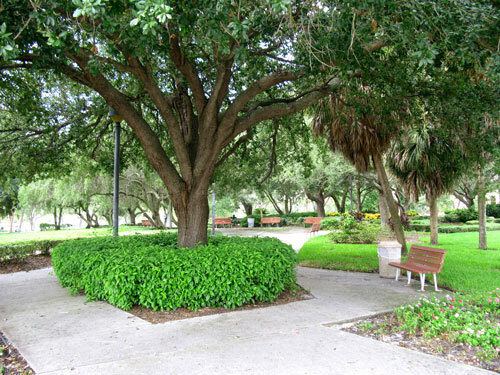 The breeze is gentle, the landscaping is perfect, and there are plenty of benches. 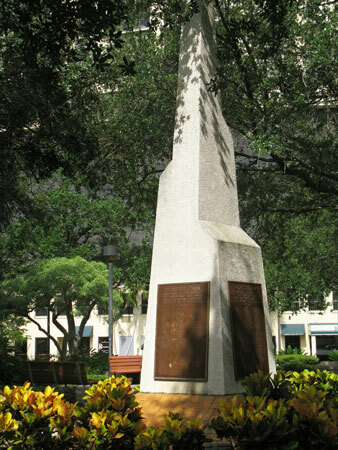 Named for the people who helped found and establish St Petersburg FL, it has a short, winding pathway around a towering memorial to those individuals. Here is the view you would see if entering from Beach Drive on the west side. To get to the park, just take Central Avenue as far east as you can go. It will be on your right-hand (south) side. This is the view you would get from the Bayshore Drive entrance a block to the east from Beach Drive. The benches on the Bayshore Drive side face the St Pete Yacht Club Marina. It is pleasant to watch the boats quietly pull from their slips on lazy Florida mornings. 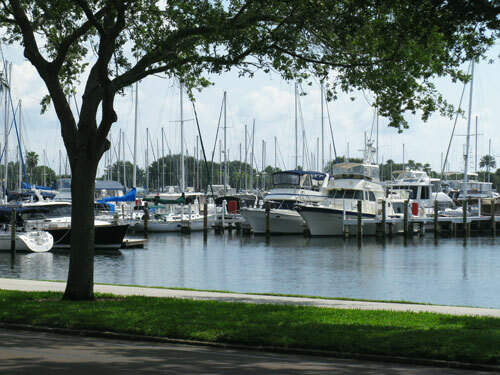 The view of the marina basin is restful. The landscaping in the park is beautiful. It is lush, green, and perfectly maintained. The focal piece in the park is this stone memorial to the founding fathers and insightful people who helped turn St Pete into such a beautiful waterfront city. 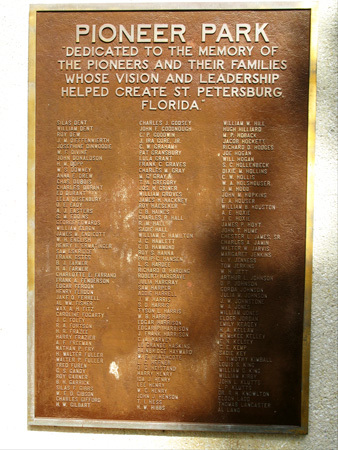 On each of the four sides of the memorial is a bronze plaque honoring those who were vital in the enrichment of St. Petersburg FL. 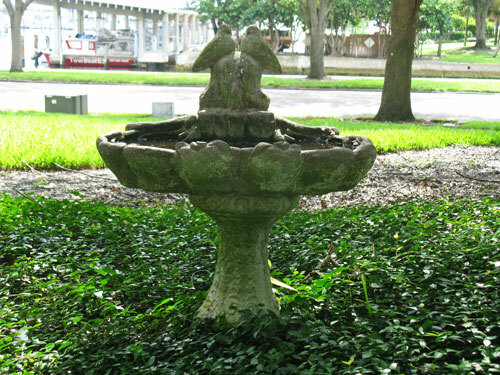 The only other structure in the entire park is this old birdbath near Bayshore Drive. A block east, on Central Avenue, from the Beach Drive entrance to the park is Ceviche's Restaurant. A lot of the older patrons of the park (like me) enjoy having breakfast on the outdoor tables, then walking down to read the paper. 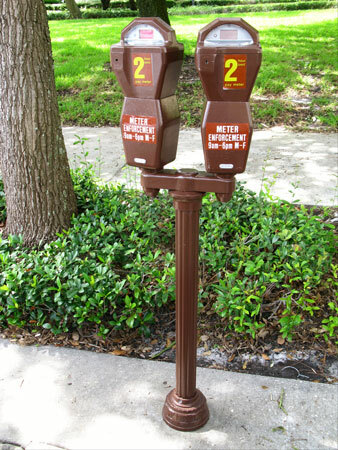 If you will be spending time here in downtown St Pete, make sure you bring some Quarters for the parking meters. Like is says, these spaces are at a premium and are strictly enforced. 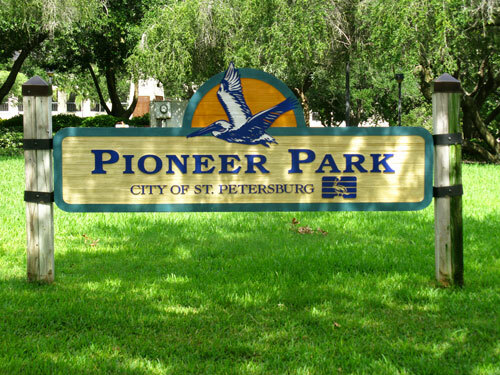 Pioneer Park is 8.5 miles straight across Central Avenue from Treasure Island Beach. It is worth a visit on your Florida beach vacation.